The Yumbox inspiration came from healthy and balanced French school lunches. The desire was to help parents everywhere pack those kind of lunches for their own kids. The moms behind Yumbox are so passionate about this that they even developed two iPhone apps to encourage kids to try new foods. Click HERE to see Kids Food Adventure and HERE to see Choose My Food. But here is the truth about lunchboxes. Passion and ideas are all well and good, but if they don't translate to a practical usable product in real life, then it doesn't do us as parents any good. 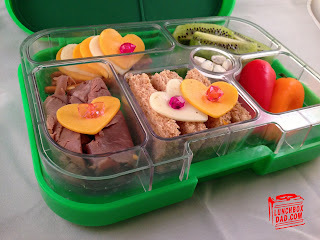 Click here for the recipe that I made in the Yumbox--a healthy lunchable style lunch! The first thing I noticed about the box was how heavy it is. It's not too heavy to carry, but the weight surprised me. It is listed at 1.5 pounds but certainly feels heavier. From the outside, it looks like many other lunchboxes, but when I opened it the interior set the box apart. The inside clear tray looks nice and I love that it is removable and dishwasher safe. However, the compartments each only hold 1/2 cup of food each. This is perfectly fine for younger children, but older kids might need a little more. This all depends on the individual's appetite. The other part of the tray that I appreciated was that each compartment is labeled to remind you of the food groups that help make a balanced diet. When I first opened the box, I didn't pay much attention to the silicone on the lid. This is a useful feature, though, because it seals each compartment. It is not recommended that you fill it with liquids such as soup or watery dressing. You can pack foods with a "Ranch Dressing" like consistency. I always recommend testing liquids if you are unsure if they will work. In our testing, we didn't see any leaks, but it is best to be cautious when packing lunches. You don't want your child to arrive at school and find yogurt covering all their other food. When it comes to the outside, my main concern was the durability of the hinge. I thought that with a few drops the hard plastic pieces would break. I did accidentally drop it on the cement and the hinges held up fine. Only time will tell how durable they are but for now they seem to hold up with no problem. The latch is easy to use and my 7 year old was able to work it with ease. Overall, the Yumbox met my expectations. I liked the removable tray, the reminder labels, and the silicone seal on the lid. However, it was a little heavy and the portion size will probably be too small for older kids and adults. Yumbox will be coming out with a bigger box soon, so I am looking forward to seeing how they adjust the compartment size and if they introduce any new features. The customer service was also great. If you are looking for a smaller basic box with little food compartments that can seal, then check out the Yumbox. You can find it online at www.yumbox.com for $28 in either pink or green. 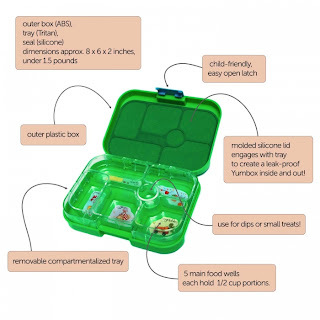 Disclosure: Yumbox sent me this product to review. I have received no other compensation for this post and the opinions I’m expressing here are solely my own.